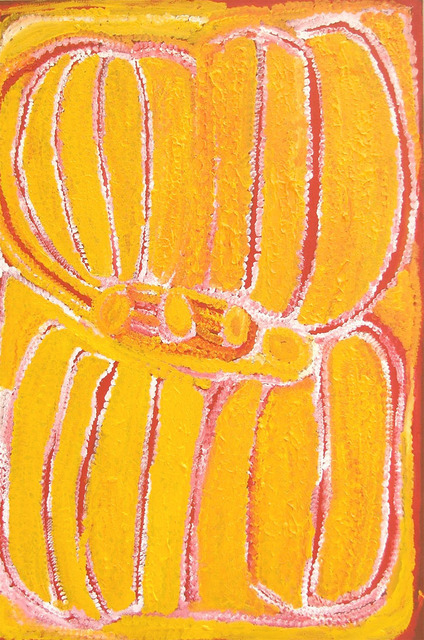 Eubena has painted some of her country south west of Balgo. This country is centered around Kunawarritji (Well 33) along the Canning Stock Route. The central circles depict a series of tjurrnu (soakwater) which are the home of Kinyu the spirit dog. The other features of the painting depict the tali (sandhills) that dominate this country. When Eubena was a young girl growing up in this area, she would sometimes leave food for Kinyu.